That’s because it actually shows the news. Dear god, what might The Post do next?!?! You can’t really say the New York Post has hit a new low, as it ordinarily resides in a substratum so far down as stymy measurement. 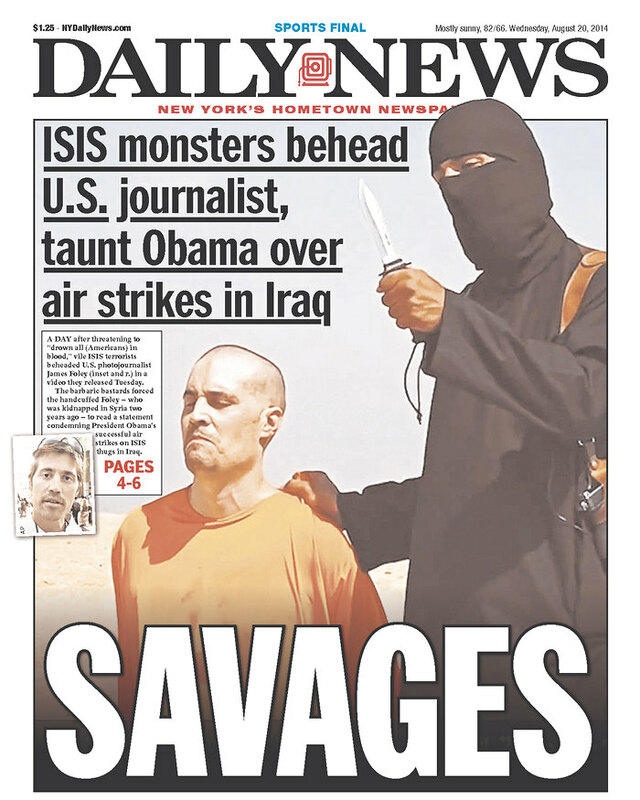 But even that can’t account for this morning’s cover, which features a screengrab of the moment just before an ISIS member beheads journalist James Foley under the headline “SAVAGES!” . . .
Mediaite will not display the Post cover, but it’s here, if you’ve gotta look.
. . . On today’s front pages, the New York Post and the New York Daily News competed for the most tasteless tribute to the memory of journalist James Foley. Under matching headlines — “SAVAGES” — both covers feature clips from the video that reportedly show Foley in his final seconds . . . The Daily News cover, available here if you want to see it, shows the militant with the knife in his hand. The New York Post, not to be outdone, shows the knife making contact. “The New York Post cover of James Foley is as graphic and despicable as we’ve come to expect,” Dylan Stableford at Yahoo wrote. But I want to know . . . Twitter will suspend its users for telling it like it is? For displaying a picture that tells the story much better than this one, which everyone else seems to be using? . . .
Twitter has been boasting that it has become the instant news delivery system for the world. Does Twitter now really want to suspend its users for accurate reporting? The storyline on this is that showing the video (which was removed by YouTube) or displaying still pictures from the video is what ISIS wants, and we certainly shouldn’t give ISIS what it wants. But what about giving the American public what IT wants? If every news outlet decides not to show the pictures, or not to show the video, isn’t it depriving its readers/viewers the chance to decide for themselves whether to watch? If the government ordered it, it would be censorship. But if every news outlet makes that decision, does that not achieve the same result? Hey . . . The news can be ugly beyond belief. But not showing its ugliness deprives the reader of fully understanding what’s going on in the world. And that’s not reporting; it’s sugarcoating. Cue the predictable shock and outrage. OMIGOD, I saw this on my newsstand!!! My child was crying!!!! I couldn’t eat my lunch after seeing this!!!! Do you know how The Post got the picture? 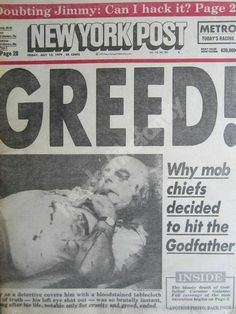 It got it because the cops invited all the New York photographers into Joe and Mary’s Italian-American Restaurant in Brooklyn, where Mob boss Carmine Galante was rubbed out, as they say. That’s right . 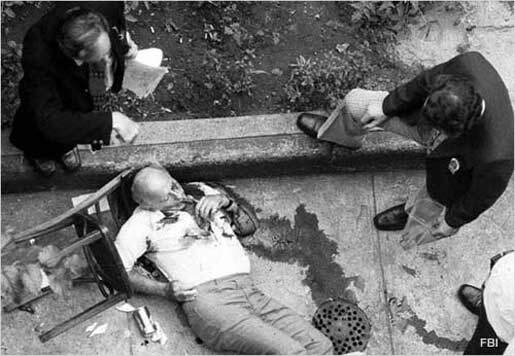 . . the cops WANTED the newspapers to show the picture, to prove that crime does not pay. I was the Page One editor at The Journal News, the rapidly disappearing newspaper of New York’s northern suburbs, in 1998, when terrorists bombed the U.S. Embassies in Kenya and Tanzania. Two hundred and twenty-four people were killed, and more than 4,000 were injured. The pictures that came out of those simultaneous bombings were horribly graphic. There were bodies strewn everywhere, many of them “crispy critters,” as journalists call them (but would never dare write it). I saw them all, but you didn’t. That’s because The Journal News had a “no bodies” policy, banning all photos of dead people. So the Page One photo I selected – it showed the bodies of some women who had burned to death in the street – was rejected outright. What’s more, some idiot pointed out that one of the women’s shirts had been blown off in the blast, and we could see her bra. Which I guess meant it might be sexually suggestive. And I suppose it might have been, if you were the sort of guy who got your jollies viewing the brassieres worn by burnt, dead women covered in soot and ash. Which brings us back to the cover of today’s New York Post. I used to work at that newspaper. It produced some stories and Page One treatments that I found offensive then, and it continues to produce some that I find offensive now. But today’s wasn’t one of them. Today’s was horrifying, terrifying, but it was honest reporting. The picture told the story. The headline enhanced it. That’s good wood. That ain’t no purple poop. You can’t make this stuff up. 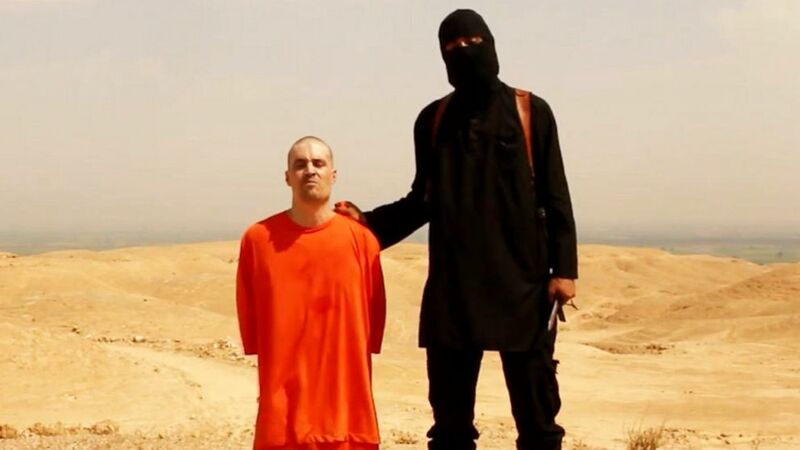 This entry was posted in In the News, Journalism, Media, Uncategorized and tagged Beheading, Daily News, Decapitation, ISIS, James Foley, New York Post by stephenbromberg. Bookmark the permalink. Your adherence to journalistic rectitude is refreshing and sort of scary in this case. I sure wish that journalism as we once knew it would become the norm once more. Fortunately we still have the Daily News and the Post to tell it “like it is” – Twitter censors and internet media wonks be damned!